Victoria is beaten by Vancouver 2-1; club returns home for Game 3 on Tuesday. 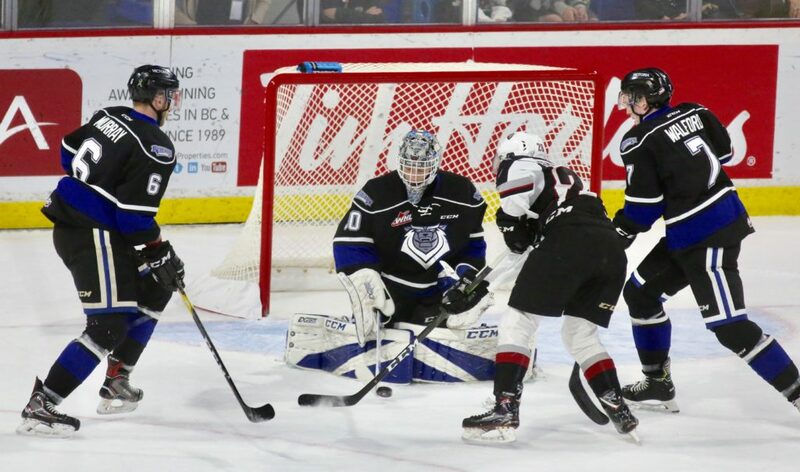 Langley, BC ­– The Victoria Royals were stymied 2-1 in overtime by the Vancouver Giants in Game 2. Vancouver leads the best-of-seven series 2-0. Royals – Ralph Jarratt 1g-0a, Igor Martynov 0g-1a. Vancouver – Tristen Nielsen 1g-1a (Game Winner), Lukas Svejkovsky 1g-0a, Alex Kannok Leipert 0g-1a, Davis Koch 0g-1a, Seth Bafaro 0g-1a. Royals – Griffen Outhouse (L) – 63:29 mins, 37 saves on 39 shots. Vancouver – David Tendeck (W) – 63:29 mins, nine saves on 10 shots. Royals – 1/2 = 50.0%. Vancouver – 1/4 = 25.0%. Overtime Games: This evening marked the 13th time in Victoria’s playoff history that the club has played in overtime. In those contests, they are 6-7. One Goal Games: Tonight’s loss was the 28th time this season, including playoffs, that Victoria has played in a game decided by one goal. In those contests, the Royals have posted a mark of 17-6-3-2, which includes a 2-2-3-0 record against the Giants. Scoring First: In each of the Royals’ eight playoff games this year, the team that has scored first has won. Meanwhile in the Giants’ eight postseason contests, the club who has opened the scoring has been victorious six times. Franchise Record: Tonight, Royals’ defenceman Ralph Jarratt tied former Royal Tyler Soy for the most playoff games played in franchise history with 45. Jarratt was drafted by Victoria in the second round, 37th overall, in the 2013 WHL Bantam Draft. Game 2: The Royals have now lost both of their Game 2’s in overtime this postseason. Back to Victoria: The series now shifts to Victoria for Game 3 on Tuesday, April 9th, and Game 4 on Thursday, April 11th. Puck drop for both games is at 7:05 p.m. Tickets can be purchased in person at the Select Your Tickets box office, over the phone by calling 250-220-7777, or online at www.selectyourtickets.com.